Those of you that have picked up New Super Mario Bros. 2 have probably also enabled SpotPass, which will be used to contribute your haul to the world coin total. We'd also assume that Nintendo will send regular updates so we can all see how ludicrously high that total gets. While there haven't been any updates as yet in the UK or North America, understandable as the game hasn't even been available for a week, an update has been sent to Japanese systems; the total is enough to make even Wario blush. As you can see in the screengrab above, kindly provided by Nintendaan, a recent update gives a figure of 36,411,918,144, or just under 36.5 billion. There's some speculation around the web that over 30 billion of these have been collected in Japan, but gamers in Nintendo's homeland have had a three week head start. We'd expect Western updates soon, and we'll see just how high the total can go. How can I look at the numbers on my game? Based on my knowledge of Mushroom Kingdom currency, 100 coins is a life. Based on the EPA, a human life is worth $6.9 million. So each coin is worth about $69,000. 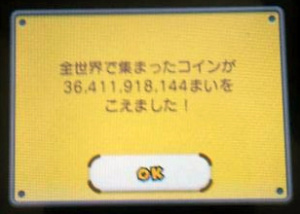 Using my calculator, I can therefore determine that the current value of coins collected in Mario is $2,512,422,351,936,000, or about as much money as the entire world makes combined over the course of 33 or so years. That ought to buy Apple. It would have been super neat if they had a little counter on the main menu that, if you choose to enable it, is constantly counting up how much the worldwide total is in real time with each game save. @Nintendo6400 I think it's a case of Nintendo sending updates as SpotPass messages, I don't believe there's a running total screen to check. We'll probably get one in a week or so. Trololol. NSMB2 is actually a surprisingly fun game. 36 billion... wow. That is to how many copies sold of the game? You'll be happy to know I've contributed about .001% of that! 23,234 of those are mine. neat idea, if useless. if only Nintendo embraced some more interesting apps that could aggregate more relevant stats around the world, that would really set them apart. I don't know of other devices doing this openly yet. what about hours spent on certain things, or steps taken between players, or stats of things that people do, like some of the old Wii polls? those were great, what happened to all that? aggregate stats can be really powerful and useful as long as the users consent to what's asked for. Why not use the camera to identify and "collect" certain things in the real world, then aggregate how many the worlds players have gotten, that would be awesome (NOT pokemon QRs, either), bird species, styles of architecture, bodies of water, town markers. oh well, Game programers and creative thinkers are yet to merge much, or we'd see more than jumping cartoons and shooting massacre games with all this great tech. I love/ hate this stuff. Glad to know that I did my bit. "May be used to buy 17% of Apple"
how much of this is for peach's taxes? I got over 10,000 after a few hours of playing on Sunday. A big chunk of that was replaying levels to find all star coins. Not dying too much helps, too, although unless the game seriously ramps in difficulty, I hardly imagine I'll need to worry about the life counter. I've unlocked world's 1, 2, 3 and Mushroom so far. Come to think of it, I wonder how many of that 36 billion count are from illegitimate copies or cheating of the game? Nintendo should make a Zelda where you collect 1,000,000 rupees throughout the adventure... On 3DS, of course. Give us some old school Zelda!!!! I just got over a million coins in there btw... 1,014,746 to be exact. 3 days: a total play time of 20 hours throughout those days. I found a coin rush mushroom pack that you can get 25,000 coins on through the three level run and I just replayed that til I got a million. Took about 5 hours. How many coins do we need to buy all of apple? JK but all the Nintendo hate via apple fans needs to STOP NOW! I wish they could show coins collected by region, such as Asia vs Europe vs Americas. That could inspire some friendly competition!